The first projects to be built at Kop van Zuid are centred around Entrepothaven. 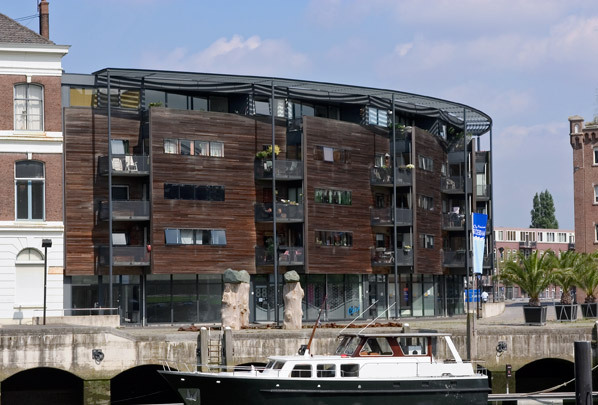 They include a housing complex designed by cepezed, who were also involved in converting the free warehouse (Vrij Entrepot). On the short side of the triangular square in front of the Entrepot building, part of the old building has been extended along Stieltjesstraat with a small block containing old-age dwellings and office space. This block terminates in a semicircular apartment building that seamlessly draws together the square and the harbour. The rounded facade is in fact a distinctive staggering of individual timber fronts. The remaining development around Entrepothaven is the work of Fons Verheijen.